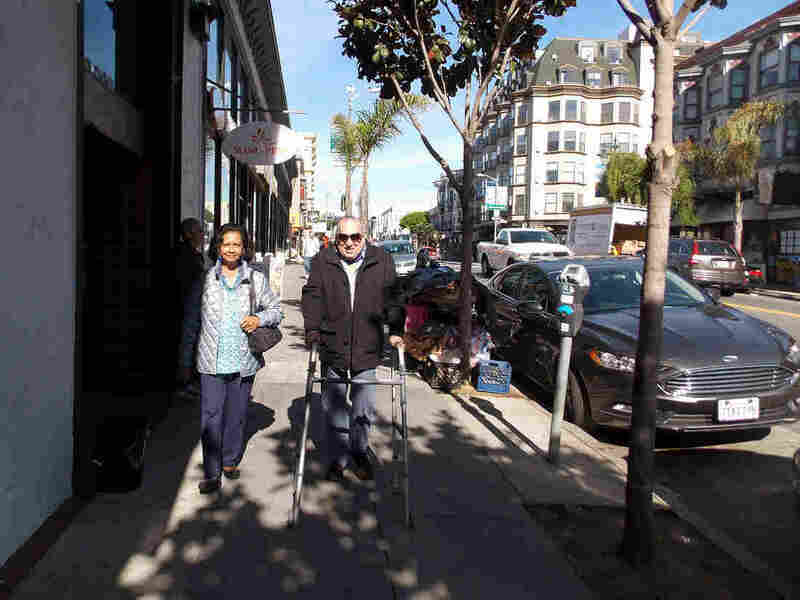 Easing Lonelieness Among The Elderly Saves Lives : Shots - Health News Little Brothers, which operates in San Francisco and several other cities, sends volunteers to brighten up the lives of isolated elderly people, helping them reduce the risk of serious illness. 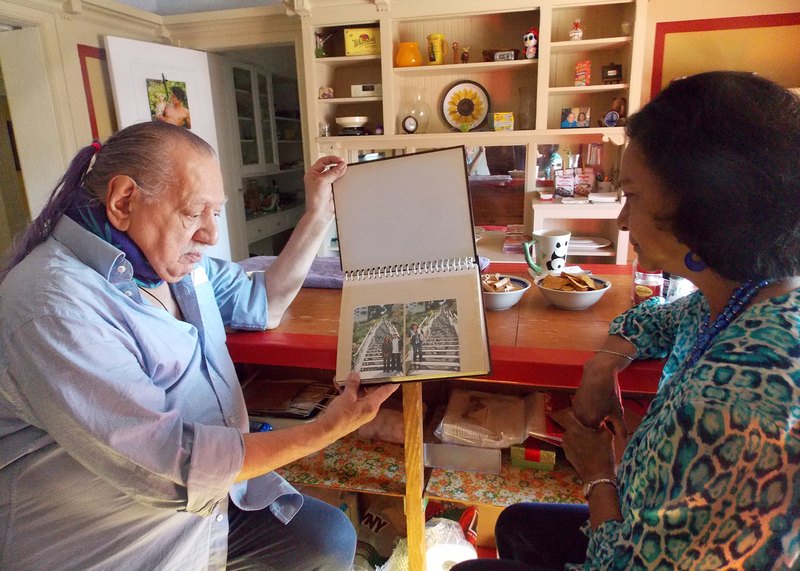 Emil Girardi, 83, and Shipra Narruhn, 67, chat in Girardi's San Francisco apartment. They were paired through a nonprofit called Little Brothers, Friends of the Elderly, which aims to relieve isolation and loneliness. Emil Girardi moved to San Francisco on New Year's Eve in 1960. He loved everything about the city: the energy, the people and the hills. And, of course, the bars, where Girardi mixed drinks for most of his adult life. "I didn't want to go out of the house," Girardi recalled, adding he only felt comfortable "going from the bedroom to the dining room." He'd started to fear the city's streets — and growing older. An out-of-state friend worried about his isolation and called a San Francisco-based nonprofit called Little Brothers, Friends of the Elderly. The organization works to relieve isolation and loneliness among the city's seniors by pairing them with volunteers. Little Brothers matched him with Shipra Narruhn, a computer software trainer who has volunteered with various organizations over the years, and became involved with Little Brothers after her mother's death. The organization started in France after World War II and now operates in several U.S. cities, including Chicago, Philadelphia and San Francisco. "Those 50 stairs you used to be able to go up and down all the time, you can't go up and down all the time," she said. "The streets are crowded and sometimes unsafe. ... Sometimes, our elders say, it's easier to stay in the house." "If someone reports feeling lonely, they are more likely to lose their independence and they are at greater risk of dying solely from being lonely," said Dr. Carla Perissinotto, a geriatrician and researcher at the University of California, San Francisco who authored the study. 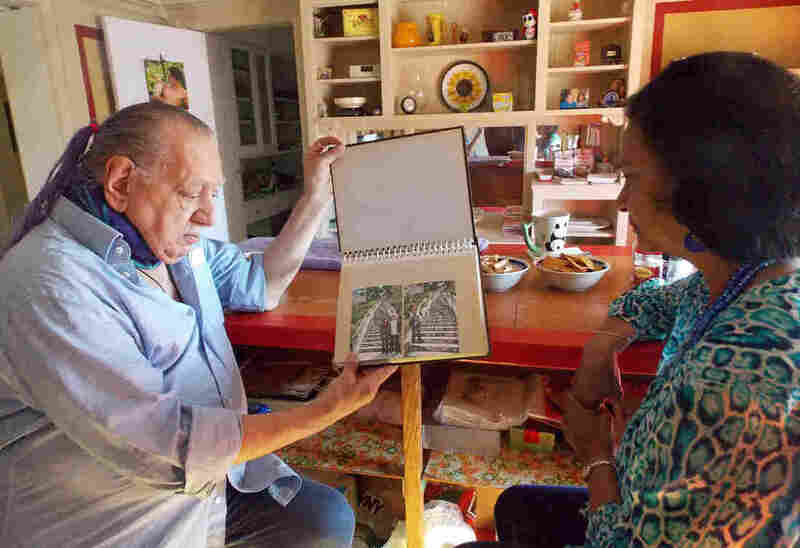 There can be many causes of loneliness, Perissinotto said, including illness, hearing loss or life changes such as retirement or the loss of a spouse. "The usual social connections we have in younger life end up changing as we get older," she said. Narruhn recalled that she and Girardi would just visit at his apartment, in the beginning. She'd tell him about her travels and her adult daughter. He'd tell her about his adventures in San Francisco. He described what the city was like as a young gay man, and told her about the friends he had lost to AIDS. They talked about music, books and cooking. "I could tell from talking to him that he had a lot of interests," she said. "At one time, he was very sociable." "Shipra came to see me, and came to see me and came to see me," he said. "Finally, she said, 'You have to get out of the house.'" Girardi (right) and Narruhn head to one of their favorite San Francisco restaurants for lunch. Because of their friendship, Girardi says, he no longer fears leaving his apartment or getting older. Research shows loneliness can hurt seniors' health. Soon, they were going to jazz shows, on walks and to the park. Narruhn said she invited Girardi to do eclectic things with her — chakra cleansings, Reiki healing sessions — and he was always game. Over time, his fear subsided. So did his loneliness. "After she took me out of the house, then I didn't want to stop," Girardi said. There isn't much research about the effectiveness of programs such as Little Brothers. But Perissinotto said they can help seniors build new social connections. Other efforts to address loneliness include roommate matching services in various states and, in the United Kingdom, a call-in hotline. "Maintaining connections, that touchy-feely thing, is actually really important," Perissinotto said. "It's hard to measure, it's hard to quantify, but there is something real. Even though we don't have the exact research, we have tons of stories where we know it's [had] an effect in people's lives." "Loneliness is a huge issue we don't talk enough about," said Dr. Charlotte Yeh, chief medical officer of AARP Services. "There is a huge stigma." One afternoon in November, Narruhn came by to take Girardi out to one of their favorite restaurants on Polk Street. The waiter greeted them by name. Over Italian food, they planned several more visits together. Girardi said he doesn't fear growing older anymore. He's surrounded by his new family. And by good music, he said, and "snapping fingers."